I really enjoy working at Catholic Charities because I like helping people. My current job allows me to help my co-workers get the tools they need to be more effective in the services they provide to our clients. 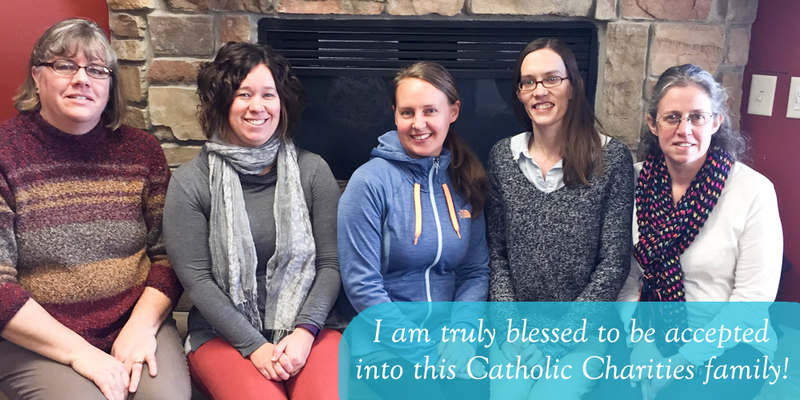 Before I started working for Catholic Charities, I was a little hesitant because I had never worked for a faith-based organization before and quite honestly, I didn’t know what to expect! I can proudly say I am glad that I accepted the opportunity to work here. Catholic Charities has opened up my eyes to the needs of people in our surrounding communities. We accept everyone who comes to our door in need, to work for us or to volunteer for us, regardless of faith, age or race. Every day at work involves doing something different and enables me to be creative through our social media, website and marketing materials. I can truly say I love the work I do and enjoy being a part of the Catholic Charities family! Catholic Charities is a great place to work! I have grown so much personally, professionally and spiritually since I’ve been here. Their mission is God’s mission. You are God’s hands and feet in making a significant difference in the lives of His people in need and living on the margins.